The noise effect is a very low, at 96dB - a reduction of 3dB reduces the noise by half. 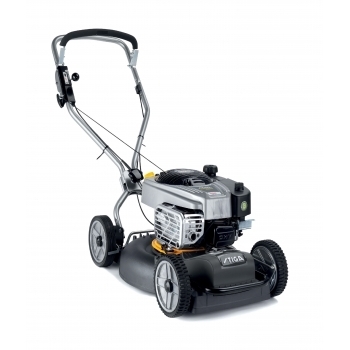 With a 51cm/20" deck and 5 heights of cut ranging from 30-65mm adjusted by a single lever, this mulching lawnmower from Stiga will give a great finish to your lawns. Multiclip Pro 53 S B self-propelled mulching lawnmower with robust aluminium chassis and wheels. Features include Briggs & Stratton 850 EXi Series ReadyStart engine and friction blade holder. The aluminium chassis is laterally offset, which makes cutting along walls and around obstacles very easy. With a cutting width of 51cm/20", this mulching lawnmower is suitable for larger gardens up to 50m x 50m.